A UV filter is a great way to protect the front of your lens from being damaged. A cheap UV filter will probably be around $10 and an expensive one will likely be $50+ with both price points being based on the size needed and likely the filter quality. Had you rather replace a UV filter from getting scratched or your lens? That's an obvious answer, so buy a UV filter soon if you don't already own one. If you have more than one lens, you should buy a filter for each lens. All of my lenses have a UV filter on them. As for an ND (Neutral Density Filter), that is something different entirely. 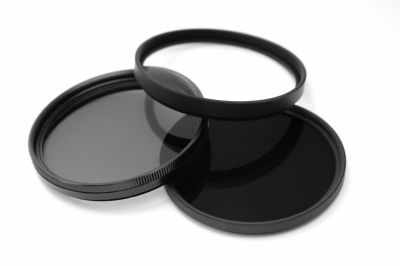 ND filters are numbered based on how dark they are like ND2, ND4 and ND8 with each being darker or you can think of it in STOPS: ND2 = 1 Stop | ND4 = 2 Stops | ND8 = 3 Stops. That means that if you are shooting outside and the sun is so bright that you have to set the f/stop at f/16, you can use an ND8 and have the same exposure at f/16 as you would at f/5.6. Hmmm... Why would you want to shoot at f/5.6? Shallow depth of field is one key thing that comes to mind. But you are thinking that you could just shoot at a faster shutter speed at f/5.6 and problem solved. Not really, if you are using your flash outside that syncs at 1/200th and you really want that f/5.6 shallow depth of field. There are other reasons to us a ND filter, but I'll leave you with this video to learn more about ND filters. It's a 15 minute video. If that's too long, just search YouTube for other ND Filter videos. Protecting Your Camera Lens With A UV Filter – It’s Not An Option – It’s A Must!